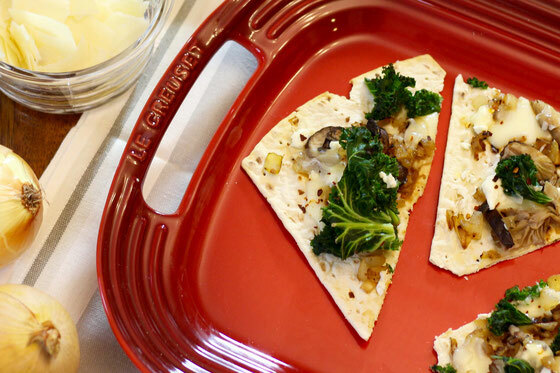 How about a delicious, cheesy pizza that’s also loaded with nutrient-rich veggies? Did I mention that it’s also super easy to make? Disclosure: This blog post is sponsored by Flatout. All opinions are my own, as always! Mushrooms are one of my favorite foods. If I could eat only five foods for the next month, mushrooms would be one of them. In fact, I love them so much that I once visited Italy during mushroom season so I could get my fill of fresh ones. So it felt pretty right to combine my loves of mushroom and pizza (all things Italian, right?!) to make the ultimate tasty mushroom pizza. I ended up creating a fairly low-calorie pizza loaded with veggies. 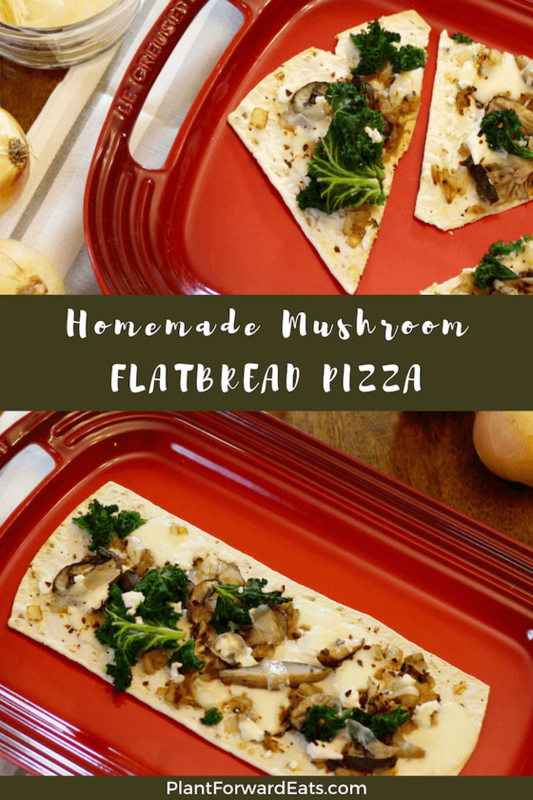 For the crust, I used a Flatout Rustic White Artisan Thin Pizza Crust. I love this product because it allows me to whip up fresh pizzas at home with a crust that’s only 130 calories and 4 Weight Watchers ® SmartPoints ® values. It bakes super quickly, too. 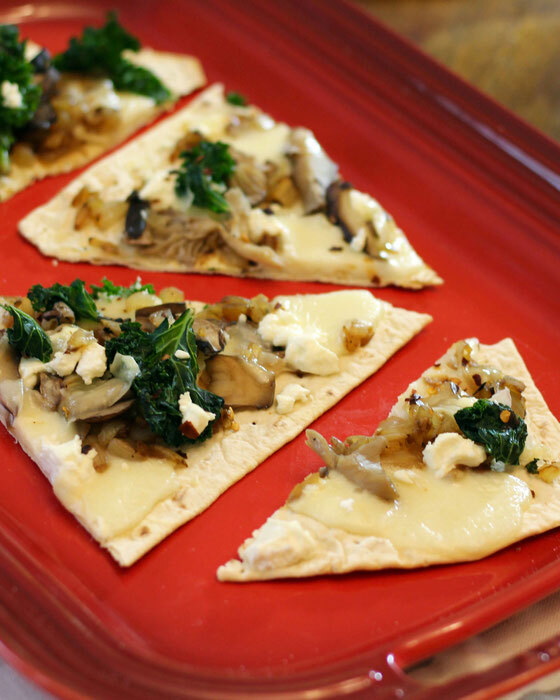 And did you know that several Flatout flatbreads and pizza crusts are now endorsed by Weight Watchers for between 2 and 4 SmartPoints values each? I started preparing the toppings by sautéing mushrooms in low-sodium vegetable broth. This adds additional flavor for very few calories and no SmartPoints values. Then I caramelized onions and garlic. Many people think you need lots of oil and sugar to accomplish this, but you actually don’t need either! I next cooked up some kale for a touch of green, as well as extra nutrition and filling fiber. I love a cheesy pizza, so I topped the crusts with a part-skim mozzarella, goat cheese, and Parmesan. I added the veggies, plus a sprinkle of red pepper flakes for a hint of spice. Then my pizzas were ready to pop into the oven! You end up with pizzas that are high in protein, offering 11 grams (22 percent of the daily value) per serving to help keep you full. This recipe makes four servings, so it’s great for family pizza night. Or if you’re like me, you can make it for lunch and store the leftovers in the fridge. I suggest serving a couple of slices with a side salad or some steamed or sautéed veggies to add even more greens to your meal. Preheat oven to 375° F. Place mushrooms in a small non-stick pan and add vegetable broth until just covered. Cook over medium-high heat until most of liquid is absorbed, about 3-4 minutes. Add kale to pan, along with a small amount of broth. Cook until most of liquid is absorbed and kale is tender, about 4 minutes, stirring occasionally. Meanwhile, place onions and garlic in a small non-stick pan; add vegetable broth until just covered. Cook over medium-high heat until translucent, about 5-7 minutes. Continue to cook once liquid is absorbed; stir frequently as onions and garlic begin to brown. Place cooked vegetables aside. Next, treat a large non-stick cookie sheet with spray oil. Cook pizza crusts for 2 minutes. 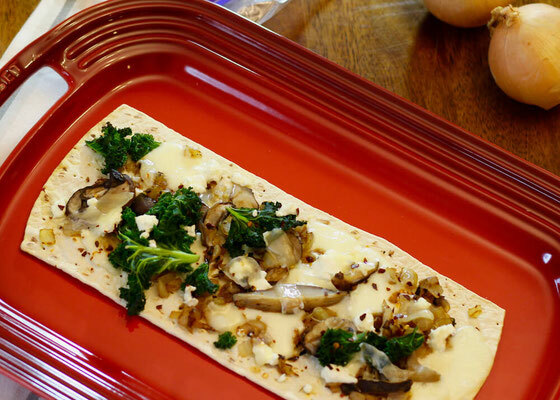 Remove, and top with mozzarella, onions, garlic, mushrooms, kale, goat cheese, Parmesan, and red pepper flakes. Drizzle with olive oil, and cook until cheese is melted, 5-7 minutes. Slice, and serve immediately. Serves 4. What are your thoughts on this topic? What are your favorite toppings for a healthier pizza?